"Then we must go higher. We must go to him whose office it is to put down tyrants and give life to dying kingdoms. We must call upon the Emperor." "No Emperor..." . He sat still for some minutes, wrestling with a world which he had never envisaged. Popes and bishops were far better behaved when there was an emperor. Clement VII certainly learned a lesson, nor can one help thinking of Pius VII. @irishtenor Thank you for the advice. @kenstb The priest started on June 30th so I did not have much time to get to know him. I traveled to Oxford UK for a continuing education workshop for church music and choral conducting this past July. Coming back to this is really upsetting. I had the meeting with him today and it went better than I thought. We came to a compromise and he changed a few hymns on the list that I made. @Ralph Bednarz We currently do not have a choir but we have a great mezzo-soprano who cantors for us and we do sacred solos from time to time. The church had no music what so ever before I arrived so I am trying to choose hymns and chants that are accessible to them. I also use different psalm settings, such as the chabanel psalms from ccwatershed which have worked well. @chonak I think this has been the biggest single problem of Western Christianity for 150 years: the defection of fathers. 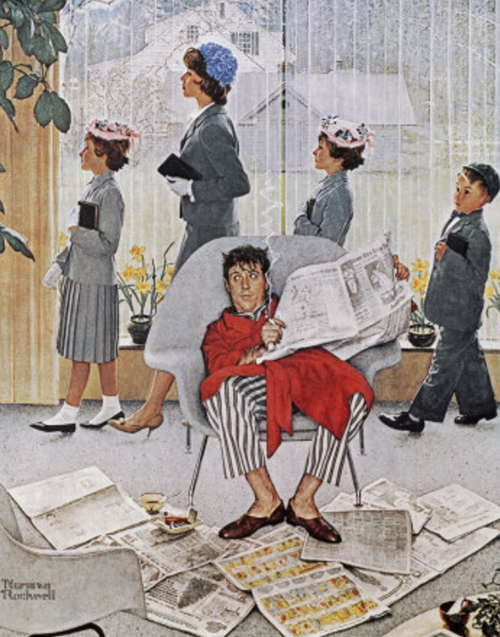 I'm reminded of this illustration by Norman Rockwell titled "Easter Morning (1959)"
I may have spoken too soon about the situation with this priest. It seemed as if things got better regarding our meeting and working relationship. Last weekend, I was unable to attend the masses so I called a substitute to fill in. Then yesterday, I received an email from the priest saying "Hi, as you may remember our planning together has ended, as of last week. I planned the next 3 weeks of music." He then goes on to list the music. This comes as news to me since we agreed to work together to prepare the liturgy. In addition, while all other employees have been paid, including cantors and substitutes, I have not been paid for 5 masses in July. The priest keeps telling me that I will get paid and that they are working on it. I'm wondering what course of action I should take at this point besides preparing to leave the position.